Tennis stars Pat Cash and John McEnroe play guitar. Yannick Noah, the French Open Champion of 1983, has a successful music career. And Robert and Michael Bryan, better known as the Bryan Brothers, have their own band. It all adds up. Tennis and music just go together. 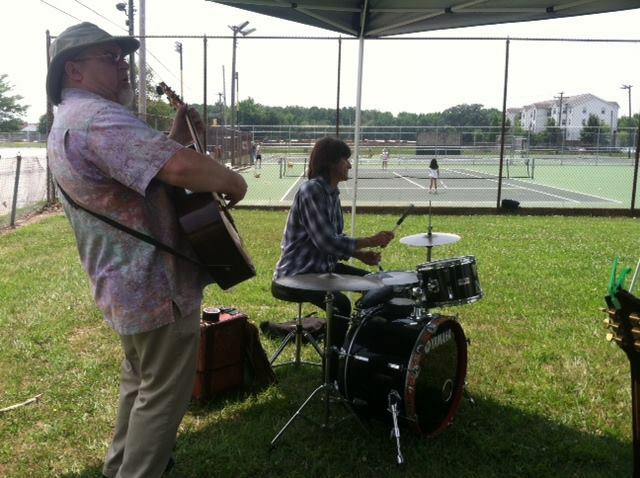 The “Tennis Rocks” Play Day in Newark, Delaware, featured tennis instruction and live music. Monty Cullum, the director of Tennis Rocks, is one individual sharing that message. Tennis Rocks, an organization based in Delaware, uses a music curriculum to help teach tennis. “When I was 16, if you asked me what I wanted to do with my life I would say, ‘play tennis all day and music all night,’” Collum said. It was this idea that, years later, inspired Cullum to begin Tennis Rocks as he explored the connection between music and tennis. Cullum now hosts USTA Play Days and offers classes that teach tennis while using musical instruments alongside the court, including guitars and bongos. Cullum said this teaches music theory and important life skills such as cooperation, listening, and pattern recognition. Tennis is much more than the act of just swinging a racquet, just like music is more than sound. Music is meant to inspire movement, and this innate connection between music and the body makes it an asset to many athletes. In fact, music can be used as a medium to help provide tennis beginners with certain skills that will help them excel at both mental and physical aspects of the game, while the learning the importance of discipline, practice and hard work. No one aces a serve their first time – it is a learned skill that takes time and discipline to develop. A player must learn and master each element of a serve before putting them together to complete the shot. Similarly, music students are required to learn how build a basic cord, play a scale and read music before they attempt to recreate Beethoven’s Moonlight Sonata. This methodical, step-by-step practice required to play an instrument is the same practice model that is important to mastering tennis. Learning an instrument also helps young players get in touch with their body and learn hand-eye coordination. Tennis is all about learning how to move and coordinate the whole body so that one cannot only hit the ball, but also get that ball to go in the intended direction. They must learn to make the connection between what their brain wants to do and what their body is actually doing. Music becomes a creative way to build body awareness off the court, a skill that will then translate over into their tennis game. Playing wind instruments such as the trumpet or the flute teaches athletes the importance of breath and helps them to maximize each breath. Learning percussion instruments such as the drum teaches athletes rhythm. In a submission to “The Sports Journal”, Brunel University’s sports psychologist Dr .Costas Karageorghis and psychology researcher Dr. David-Lee Priest asserted the connection between rhythm and sports. “Music replicates forms of bodily rhythm and many aspects of locomotion. Music can transport the body through effective movement patterns, the body providing an apparent visual analogue of the sound”. As drummers and percussionists learn to keep rhythm, they are simultaneously learning how their body moves, creating a hyper awareness that will pay off on the court. There is also a mental aspect of tennis that music can influence. Music helps people learn to stay in the moment and not break focus. Musicians must learn to live within the notes on a page as they perform a piece of music. This teaches concentration and focus- allowing one to ignore outside distractions while also being aware of their surroundings- skills necessary for tennis players. Even for non-musicians, just listening can have an equally profound impact. Simply hearing music elicits a physical and emotional response. High intensity music like AC/DC will increase an individual’s heart rate. As the song tempo quickens and the music crescendos, the heart races with the beat and adrenalin surges through the body, which in turn infuses the muscles with oxygen and excess energy. This physical reaction then creates a sense of high energy excitement. Likewise, if one is stressed or getting too amped up, listening to low intensity music like Enya will induce a sense of calm. In an interview with The Tennis Space two-time Grand Slam champ Victoria Azarenka described the impact music has on her tennis game. For years people have used music to improve their performance in sports, often times without even realizing it. Whether it is a musician using their off-court skills to improve their game, a player listening to music to get pumped up for a match, or an athlete using it as a distraction while working out, music is a paramount tool that can be used to help players of all ages and skill levels.